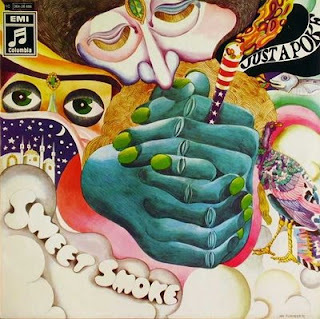 SWEET SMOKE were a 70’s Progressive Rock band who spent more time in Europe than in the Continental US. Along the way they managed to bump into Conny Plank who Co- engineered this album with Klaus Lohmer. SWEET SMOKE combine fusion jazz elements (aka Miles Davis) with German Krautrock elements and with the addition of flute and sax gives a Canterbury feel as well. Vocals are present and quite psychedelic sounding actually at times with some banter and chanting going on. This album is essentially 2 long epic tracks oscillating between blues, jazz, rock, funk and psychedelia. Band was Andrew Dershin (bass), Jay Dorfman (drums and percussion), Marvin Kaminowitz (solo guitar, vocals), Michael Paris (Tenor sax, alto recorder, vocals, percussion), Steve Rosenstein (rhythm guitar, vocals). With the length of the 2 tracks there is lots of room for exploration and an almost improvised feel to the movements. On track 2 “Baby Night” there is a simply killer percussion solo which sounds like solar drums and will absolutely blow your mind. This is truly awesome music and is heavily recommended to lovers of prog-psych rock.